Manshead School are finalists, whoohoo!!! Today I realised just how far mobile computing has come in the last 12 months. This time last year I was on my way to the GameHorizon conference in Newcastle as I am now. The trip was memorable for a number of reasons but in no small way because I'd recently bought an iPhone and the trip was the first time I'd had a chance to sit down and spend some serious time with it. It was at that point that the penny dropped for me and I realised what the device was all about, I still maintain there are much better... well, phones... out there but the thing with the iPhone and iOS/iTunes generally, is the flexibility they provide their user with. It really comes back to a Swiss army knife thing, there are almost always better tools for the job but if they're not to hand then the knife is a brilliant alternative. It's the same way with iOS. Anyway, while waiting on the platform at Peterborough I happened to spot the scene pictured here, Sara (I introduced myself afterwards!) 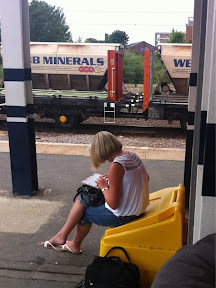 perched on a yellow bin at the end of the platform, touch-typing like a dervish in her iPad. 13 months ago this scene would have been unthinkable, true very occasionally you might have seen a stressed-out salesman swearing at a battle-worn Thinkpad, but a smart, attractive female... much less likely. Such is the change that iOS devices have sparked in our way of life, they're allowing us to fill every last minute of our lives with correspondence, media consumption and play (at least until the batteries run out) and what's more, for the first time, it's socially acceptable - even fashionable - to do so. You caught the fab Sara and didn't get her autograph ? What were you thinking man! Hey deb, I'm still sitting next to Sara so hopefully there's still time!